Raising rabbits for meat is just about a forgotten hobby these days. Fifty years ago, they were a pretty common part of the food chain and lots of youngsters had a hutch out back. Until a few years ago, a Boy Scout could earn a merit badge for rabbit-raising. Even 4-H has relegated rabbits to “companion animals” so they are lumped in with dogs and cats rather than chickens or meat goats. In our state, the American Rabbit Breeders Association cannot get the agricultural extension agents to help or promote rabbits to youth at all. After lots of study and a little experience, I think they are a natural fit for preppers. We became interested in meat rabbits for a number of reasons. First, we dislike raising the genetically modified Cornish X birds that are typically sold for meat. Everything about them is so unnatural, despite what feed you put in them. 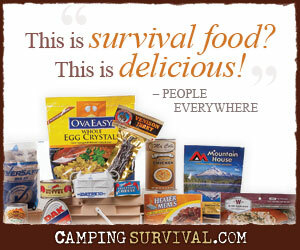 Second, from a prepper’s standpoint, they have some important things in their favor. Their diet is largely things we could provide for them if we had to (though we will use rabbit feed for best results as long as we can), unlike the large input of grain chickens usually need. Yes, free-range birds can hustle a good amount of their food, but being loose means they are more prone to predator attack or theft, too. Third, they are prolific (I’ll bet you’ve heard that! 🙂 ). Most are of breeding age by 6 months old and then can produce litters of 6-12 at least every 8 weeks. (Rabbits have actually been known to have 13 litters a year, but it is not healthy for them). If each rabbit weighs in at 8 pounds (at least), you get a lot of return on your investment. Even the most conservative estimates are well over one hundred pounds of meat from the offspring of one breeding pair! Additionally, the meat is quite lean, so it’s a healthy choice for nearly everyone’s diet. It can be used in any dish that would commonly call for chicken and is nearly indistinguishable to those who didn’t know what they were eating. They need very little space compared to many animals. Ours are housed in 2 X 4 foot cages within a larger hutch that is up off the ground and within a fence. Rabbits do pretty well in the cold, but need shade and air circulation in hot weather. For this reason, we have sited the hutch on the north side of an outbuilding that gets only morning sun. The fact that most people just think of rabbits as “pets” these days adds another benefit- you can be prepping in plain sight with none of your neighbors aware. Some communities ban chickens and other “livestock,” but rabbits are usually exempt from that. (I wouldn’t do any “processing” in view of my neighbors, though. If anyone asks about the rabbits, you can tell them you have them because your children really enjoy them and the manure/worm compost is a great addition to your garden- you will be telling the truth). There is little maintenance since the mess drops down into worm compost bins below. Children are easily able (and usually very willing!) to take care of them largely on their own. Because of these reasons, I think they are ideal for preppers. They will provide a steady supply of protein and, as a bonus, some really nice fur. Maybe the reason that sealed it for me, though, is the opportunity for charity. Two or three does would provide us with more offspring than we could eat, thus giving us some to share or, even better, the possibility of providing breeding stock to help others get started. In the next part, I will share information about which breeds are good candidates for preppers. Great post – anyone that ever raised rabbits as a kid knows how much they can multiply! Thanks. We had a surprise Sunday morning. I had never seen our breeding does “accept” the buck, so as far as I knew we were still twiddling our thumbs waiting for the does to be bred. And heat can leave bucks temporarily infertile, so I wasn’t holding my breath. Apparently I was wrong. When I went out to feed, there were 2 hairless pink things with their eyes closed but wiggling around. Their mother is young and a first-timer, but she seemed to do alright. She had pulled fur during the night and I think she was nursing them. Unfortunately- probably due to the 100 degree heat- both expired in the last 24 hours. We have another doe that may be pregnant. She acts aggressively toward the buck when I take her to him now. From what I have read, that may indicate she is already pregnant. I guess we will see in a week or so. Other good options (i’d consider on top of and after rabbits) would be ducks and small sheep. Rabbits actually don’t eat that much grass as i’d thought and prefer leafy food, but both ducks and sheep will take to the grass. Also, chickens don’t eat as much grass as ducks and duck eggs are in many ways superior to a duck’s. Also, i was surprised when viewing vids showing how to butcher rabbits; it’s quick, clean, humane, and easy. Good to have watched, if even once. Very good points! Thanks for the comment. We are in agreement about the ducks. They are actually our best layers and don’t tear up the grass the way chickens do. They get more of their diet from the free green things than chickens also. Another thing I have noticed about them is that if they have a light source, they are active hunters at night, unlike chickens. I suspect that has something to do with why we saw exactly 2 cicadas at our house all spring. I plan to get a post up about the ducks and our geese soon. We’ve never raised sheep, though we’ve discussed it. No one in our house is wild about mutton and we don’t want to shear, so we’ve held off thus far. We have a dozen or so extremely annoying goats. In theory, they clear brush for us. In practice, they go through fences, decimate our orchard, and gather on our porch when it rains. I think they are all headed for either the freezer or the sale barn. Another good choice for survival / civilization reboot is pigs and that goes into what chickens ARE good for as well: set a pig on land that you’d like turned up and they’ll tear it up in record time; then you set the chickens on land to pick off the unwanted seeds and bugs. These are destructive talents, however, that are better suited to the larger homestead. The rabbits appear the first and best choice any way you look at it, i think. We are presently growing out a pig for the freezer this fall and that has been interesting so far. He doesn’t “pig out” or “sweat like a pig.” He’s actually a picky eater and pigs don’t sweat- they wallow in mud to cool off. He also builds himself a “debris hut” every day. As you’ve suggested, I’ve thought about housing a pig in the spot we’d use for the following year’s garden, then follow with chickens. Between the weed and bug removal and application of fertilizer, it ought to be a perfect spot for veggies! We are always looking for ways to conserve, reduce cost, or repurpose things. I’ve found if I mix surplus eggs into the pig’s food, he will actually eat hog feed. Works out well for everyone. No sense in letting the eggs go to waste. Ditto for fallen/overripe fruit. SOMEthing should make use of it. It should be going to produce something- eggs, meat, etc. We’re trying to get a good vermicompost going under the rabbit hutch too. Thus far, between heat and sudden downpours, I don’t think the worms are doing well (but unfortunately, the flies like it). I will try to get more this fall. Surplus worms can go into poultry for winter protein.